I’ve owned a fair amount of gear in my time. I am not a “gear-head,” though – first and foremost for me is the music and the playing of the instrument! Saying that, a new guitar is more awesome than words… the best treat I can imagine. It is better to open a new guitar case and inhale the waft of six-string sweetness than to partake in any other material pleasure (give me the axe of the gods any day over a sports car). – Cheapo classical guitar out of Argos. 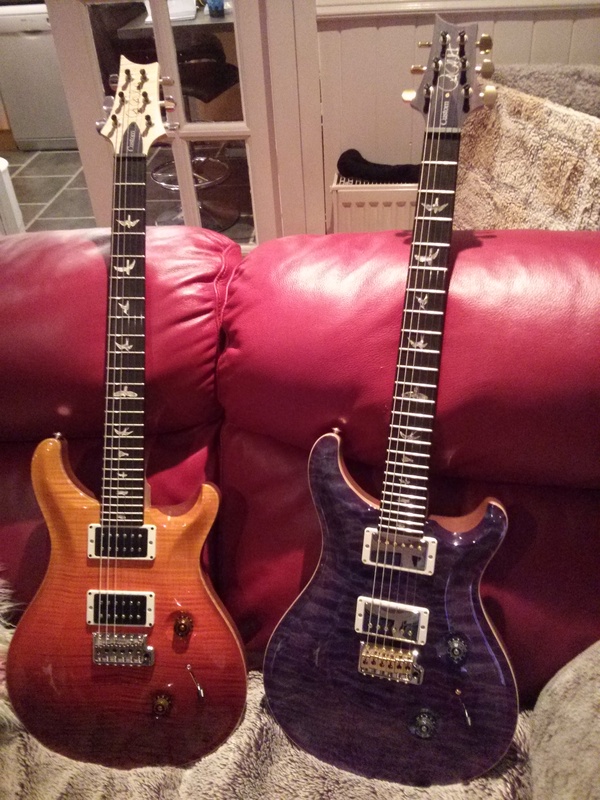 The album was largely recorded using Ibanez RG and SA series guitars. My current gear arises from the fact that I needed it to be top notch and reliable for gigging. When I play guitars, feel comes first. You can’t get that if you buy a guitar “blind” online (so support your local guitar shops!). 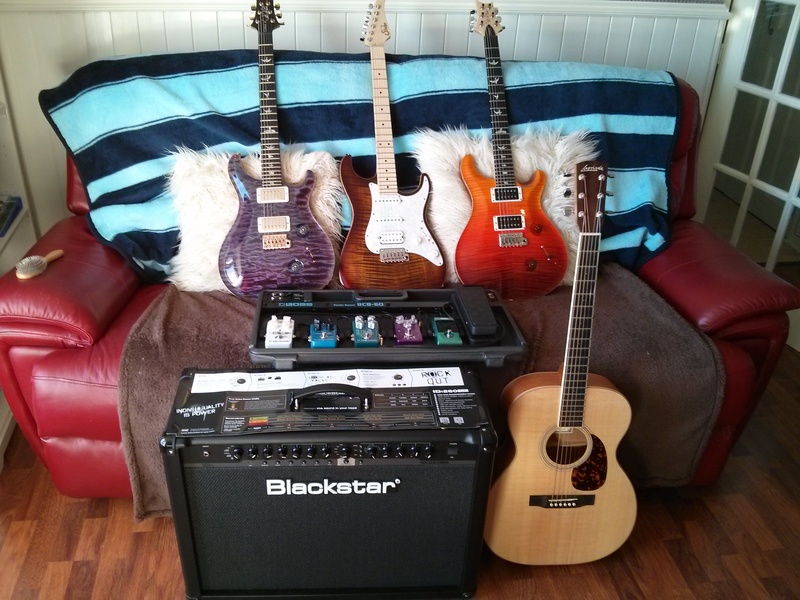 I’ve played several versions of the same model of guitar and each one has felt different. When it feels “right”… I buy. Only if it also sounds great! (Orange fade, 10 top) 2013 PRS Custom 24, Experience Model with flame maple neck, ebony fingerboard and uncovered 57/08 pickups. I almost walked past this when I was trying out guitars in 2014 (for hours – and rightly so given the price!). It is simply the best guitar I have ever played. The 57/08s sound perfect. This thing stays in tune all day long and also looks the part. Enough said. It is my favourite guitar. 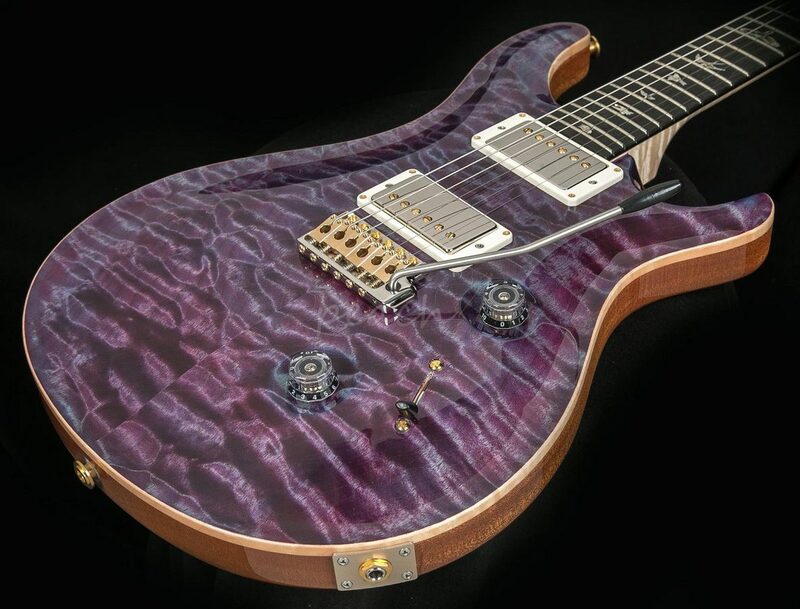 – (Violet burst, 10 top) 2014 PRS Custom 24, Wood Library Model with flame maple neck, ebony fingerboard and covered 59/09s pickups. I liked the orange PRS so much that when I saw this one I just had to have another (!). The 59/09s are somewhat hotter (more bite, a little more treble). The neck on this guitar feels like velvet – it is very comfortable. 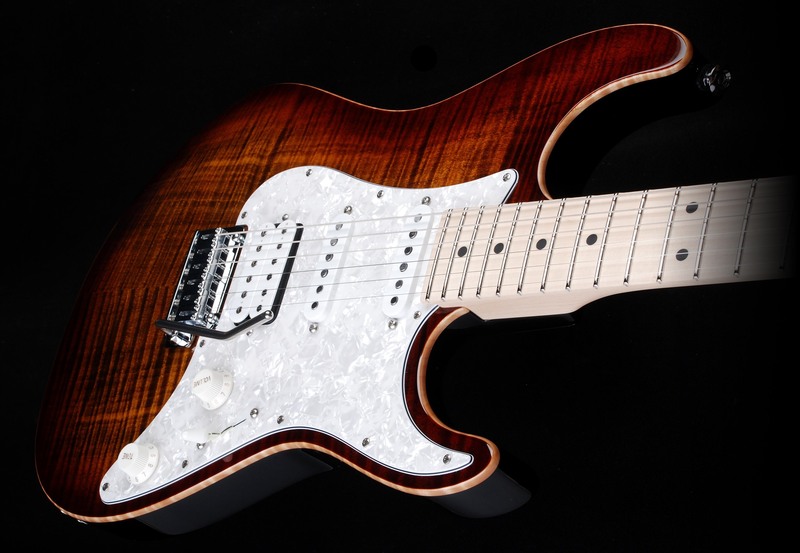 Suhr Pro S4 (same spec as the new Standard Pro models with the stainless steel frets). FL single coils and SSH+ humbucker. This thing just sounds ALIVE (each pickup selection is so articulate in its sound) – tone machine! I AB’d this versus the Suhr Moderns and much preferred how this one sounded and played. I actually almost bought this instead of my orange PRS at the time. I passed up on it but months later bought it second-hand for a great price. 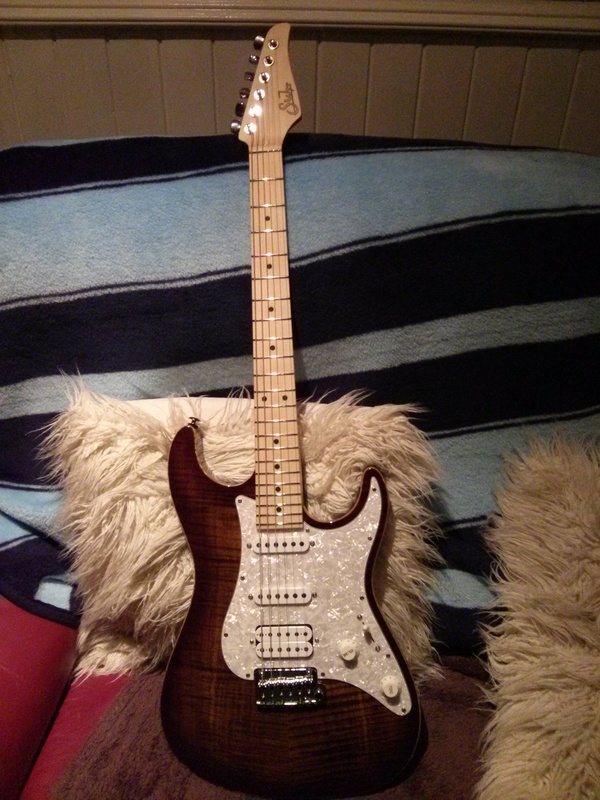 Hats off to Suhr, there was a small issue with neck discolouration and they replaced the neck for free, even though it was bought second-hand. Top company. Should everybody have an acoustic guitar? I don’t know. I tried some great nylon-strung Taylors recently which played real nice. In any case…. I used to have an amazing Little Martin but fancied a bigger-bodied and more fuller sounding acoustic. Long story short, this thing sounds absolutely sublime and projects very loudly (check out the Guitarist review on youtube). All wood for under £1k. Totally awesome. Rugged, robust, valve emulation (without the hassle of valves) – sounds killer. Included FX section is a great backup if my pedal-board ever goes down. If one speaker blows, there are two in there. So, lots of redundancy. 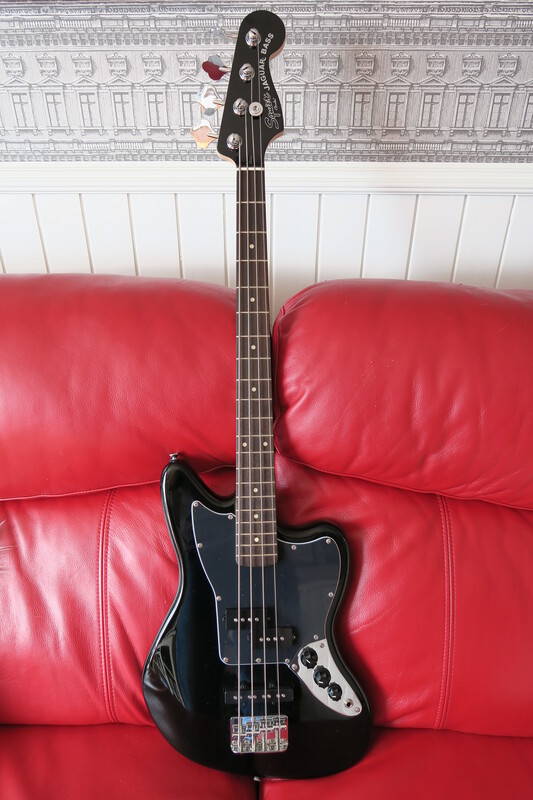 I just bought this bass for recordings. Picture taken on my new Canon G7X camera. TC Boost – for those important solo moments (if you don’t like using the volume knob on your guitar). TC Dreamscape (chorus, flange..) – does what it says on the tin.